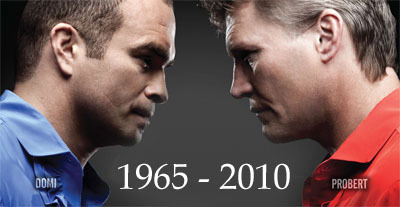 Photo tweeted out by Tie Domi through his official Twitter account. It is apparently Max Domi’s game-day socks. 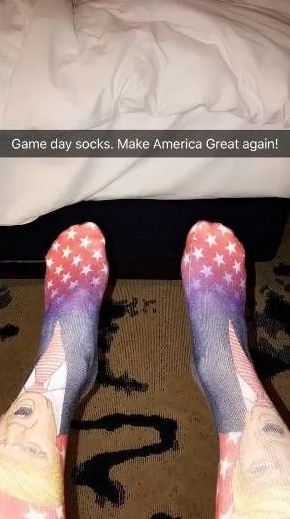 Only during the most divisive election in memory would a pair of vanity socks cause such an uproar. “My son @max_domi wore these socks yesterday and he is [Canadian]. @realDonaldTrump won & so did @ArizonaCoyotes,” the 47-year-old hockey vet typed alongside the image. It didn’t take long for the backlash on Twitter to begin, with fans expressing their anger at what they interpreted as Domi family support for controversial president-elect Donald Trump. “The Domi family lost a lot of respect with this,” tweeted Nick Richard. “I’ve been a fan of yours since I was old enough to understand hockey. This makes me sick,” added Emiley MacKinnon. Domi’s daughter, Avery, was quick to come to the defence of Tie and Max. Last Friday, the New York Islanders and Pittsburgh Penguins played knowing full-well that things were likely to turn dicey. What resulted was hockey mayhem. Two weeks ago, during a different Islanders-Penguins game, Islander goalie Rick DiPietro was knocked out by Penguins goalie Brent Johnson. DiPietro suffered injuries as a result and is missing over a month of play. When the teams played again, the hockey code of honor called for retribution on the Islanders’s part. They delivered. With the NHL’s trade deadline less than four weeks away, you’ll be hearing most, if not all, of the Toronto Maple Leafs’ roster mentioned in rumours. However, if you know what’s good for you, you won’t develop an ulcer or worry yourself sick over any scuttlebutt. The term “sucker-punch” has traditionally been used to describe a punch thrown at an unsuspecting player. There is no hard criteria used to define it, but every NHL player knows what it is and most consider it among the most dangerous and reprehensible of acts. A Strange Dream Not Involving Waffles, but Pat Quinn? In the absence of any game analysis or waffle throwing evaluations, I thought I would simply share an odd dream I recently had…. I awoke last night in a cold sweat with cloudy thoughts of a Jeremy Roenick game winner, Dominik Hasek and Arturs Irbe standing on their heads and an unusual amount of players screaming at NHL referees. Ok, so I had a strange dream, our old GM Pat Quinn had actually taken over Brian Burke’s mind and body and was in actuality our current GM in the form of Burkie. Now that I have lost most of you, to the remaining readers let me at least explain further. Tie Domi comments on Pat Burns 11-29-2010. Detroit Red Wings forward Kris Draper will make his season debut either Friday at Anaheim or Saturday in Los Angeles, coach Mike Babcock said. The Wings begin a three-game road trip tonight in San Jose (10:30 p.m., FSN). “I’m ready when I get the call,” said Draper, who had hernia surgery last month. Brian Burke celebrated his second anniversary as general manager of the Toronto Maple Leafs Monday. 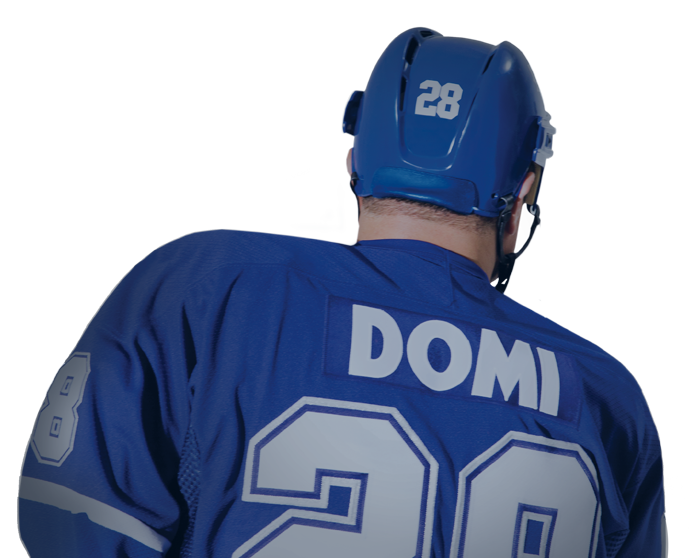 Tie Domi is proud to announce an exclusive offer of signed memorabilia through A.J. Sports World. Get a personalised item for your collection! Items in your current collection; such as jerseys, sticks, equipment posters and artwork can also be personalised! The holidays are coming, and a personalised collector’s item makes a great gift for a true fan! Tie is deeply saddened by the loss of Bob Probert. The sudden and untimely passing of his long time friend is a loss for not only for family, friends; but also for loyal Detroit Redwing and Chicago Blackhawk fans, and all hockey lovers. Tie extends his sympathy and condolences to Dani and the children.